Re: Projectors or 4K Monitors? I'll just add my grain of salt (for new members) as old timers already know me . Simulation allows me to keep on with what I love best: flying airplanes, and what a treat it is to have a full 737 in the hangar!! This being said I spend all the time I need to prepare meticulously every flight in the 73, using ..."paper maps and approach plates" programming the CDU properly as a back up, and going through all preflight operations. 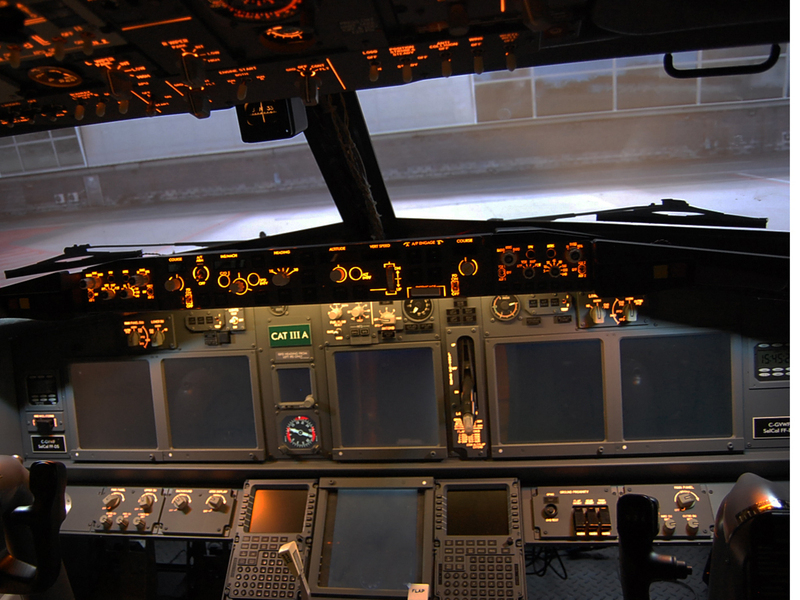 As I fly the airplane myself (vs VNAV LNAV pushbuttonning) the ratio of looking at my instruments and controls to looking outside the window is about 10 to 1. I use ONE Optoma HD with which I manage to fill the two front windows from CPT and FO point of views. Conclusion: Of course a 220 or 180 visual is fantastic and much better but a full coverage of the front windows is more than enough for immersion (IMHO) . Lets put it that way, you will save thousands of dollars,tons of hair-pulling hours trying to match views, bend blend, synchronize, change videocards, etc etc . I single huge outside view is an option also worth considering, allowing immersion at a fraction of the "panoramic" costs, delivering mamoth FPS with all sliders right and ..piece of mind/reliability. Sadly, this debate always brings friction to the forum. Every time I see the discussion come around, I want to lock the thread with a simple (Debated before a bazillion times... Use the search feature of the forum) LOL. In any case, I hope everyone can keep this ON-TRACK.. Seems like Deja-Vu if you ask me though. I don't think anyone is getting heated or anything. We are all friends here. This is all just good healthy debate where no one is right or wrong. I learned something new out of it today from Fred so is a great thread. Everyone has a different threshold of immersion. When I started simming, I used a 17" CRT. It felt immersed to me. I moved on to a 21" CRT, so on and so on, and eventually to 3 32" IPS panels in viewgroups. I don't have a cockpit yet. Still a desk top setup and I feel immersed when I make my daily flights from KDFW to KIAH then KMIA. That being said. PJ or 4K monitors it up to each individual to make that choice. I go with the best I can afford. I have to agree with Scott: re: leaning something new, with your comment as well re: tension. I think it's a good healthy debate though and there is/was a little tension, however I also learned a few new things as well which is akin to getting a new sim part in the mail . It's great to hear from those who have been there and have the different experiences. Yes it is true this has been debated a bazillion times before, but things in this hobby have also changed a bazillion times too so I hope the thread continues and remains fruitful. Absolutely, I remember having my first projector image (about 6 feet wide) and the incredible "Whaoo" feeling as I was coming from a 19" monitor. Then famous Maurice came up with a 180 deg. Tripple Whaooo factor. And a giant leap forward. And here I am back and happy with just one proj. with close to 20 feet diag. Just saying to the new guys that they can do for a while with only one projector or big TV as there are so many other ways to spend money on the Sim. Just debating the subject a bit beyond the classic TV/Projector choice. I've got nothing beneficial to add to this topic, but it is nice to see a civilized conversation / debate about a topic. Many other online communities I belong to, feelings get hurt, people get ticked off, and topics get locked right away so thank you all for being mature enough to have different opinions!! Well I sure opened up a big can of worms here, And I am Glad I did! Because I had not found much in the way of 4K TV's Vs Projectors with Flight Sims. But this has been so Awesome and gave me some real insight. While I don't have the budget of some of you to run 5 high rigs at this point it sure gives me and some of the other newbies some resolve on which way to go! Thanks so go much! I am sure I will have many more questions. How far from the shell does your screen sit? At 240" diagonal, how does the "patio screen" effect impact the quality of your visuals? How much do you notice the effect? One of the things I've always wondered has been how large the projection should be in order to provide the feel that you are actually "siting in the real world" rather than looking at a projection screen. I know this is likely not too much of an issue; as others have pointed out here, we were all happily simming at some point using our little single monitors...meaning we eventually get used to whatever limitations are imposed on us. But since I am just starting to delve further into my plans for visuals, I want to believe I am pursuing the course that I believe will bring most satisfaction. And to your point, that may well be a single very large front view. No screen door effect from the pilot seat as the projector is HD. Distance to screen is about 10 feet. Same here with Screen door effect. I just received my Optomo 1080p Darbies yesterday and did a dry run with 1 of them. Projectors will sit a bit closer to the screen with about 40% more resolution. Unless your nose is up against the display surface, any screen door effect is negligible. With eyes about 2 feet or more away, can't even tell. I would love to see some video! Always good to see what others are doing. I won't be installing these units until the man cave is finished. Probably late Summer. James is going to help me ferry the Beech to a Beechcraft Service Center, located in Boise, Idaho... probably in a few more weeks. This thread is really a great read. I'm awaiting the base dual connection for the real yokes and columns that I finally have and will pop it on ,hopefully if it arrives by next week. Then off to figuring out what to do for the 210/220fov screen framing (anyone have plans for that? ), then getting a screen from Carl's place. Unsure of what is an ideal height, length, and best material that they offer for the best image on the screen. Ideally I'd like to look out the windows and up/down, without seeing the framing of the screen, and keep as full of an immersion as possible. Philip, go look at Northern Flight Sim and his screen. I have bought three rom him over the last two yeas and I really like the end result. Yes thank you, I've seen his stuff. A neighbor of mine about a block away is actually a welder and has a side gig going on out of his garage. All he needs is the plans (still on the hunt for) and he will put it together for way less. Thank you though. Would anyone have any insight on a good height to the 210ish fov projector screen? I'm thinking that the more screen that needs to fill in with an image, the less crisp and clear the image will be. Obviously the closer the projectors are to the screen the better, but trying to find the perfect balance. Ideally I would like to be able to look out of the windows and look up or down without seeing the frame of the screen. I've been reading anywhere between 5 - 7 feet in the height of the screen. The bigger the screen though, the less crisp and clear. I plan on using Flyelise, and am aware they have a screen designer program, but figured I'd see opinions of folks that have it up and running already. With all due respect....I don't think we want to go through the agony of the screen size debate again that has somewhat painfully been argued in this thread and in many others over the years. The agonizing debate on this has only served to confirm the very obvious conclusion on this.....if you increase the size of your screen area, you decrease the sharpness of your resolution clarity. Anything in the middle is a compromise at both ends. In that regard.....only YOU can decide what is right for YOU! There is no other correct answer to the question that can be given! The best and pretty much unanimous advice that has been given here is that you need to do your own homework on this. Experiment setting up your projector at different differences from a wall...any wall....to get a sense of what you are comfortable with. Also, arrange visits to see other setups. Until affordable new tech appears ( as mentionned earlier here) basically all has been said on the subject (IMHO). I know one new point. "Seen your videos, but could not believe my eyes... It can't be possible.. I really have no words. Never seen anything like this. Fully functional simulator at home! Cannot tell apart from the real plane!" Page created in 6.266 seconds with 27 queries.